← How Much Sugar is Too Much? With all this talk of “low” carb diets being the best method for weight loss, made me stop and think about where the majority of carbohydrate intake comes from. Typically side dishes like rice, potatoes and pastas is where our carb overload starts. One of my favorite quick fixes to lowering carbohydrate intake of any meal is to use beans and lentils as a substitute for pasta, rice and potatoes. This swap gives your meal that extra protein punch, with high fiber on the side. Whenever I do this the meals is so much more filling and satisfying. Also with this recipe you could skip the chicken all together and now you have a lovely vegan meal that you could serve over hearty salad greens like baby kale or spinach. 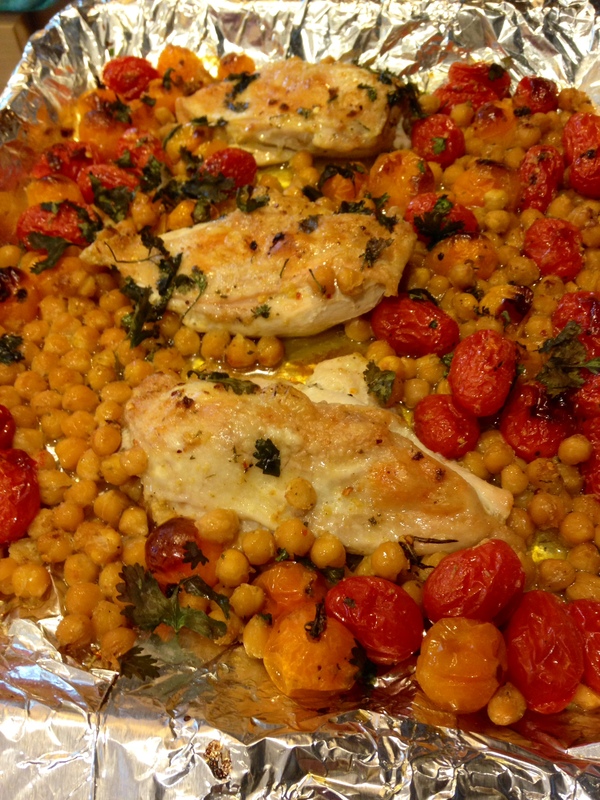 For this recipe I swapped out roasted potatoes for Chickpeas. 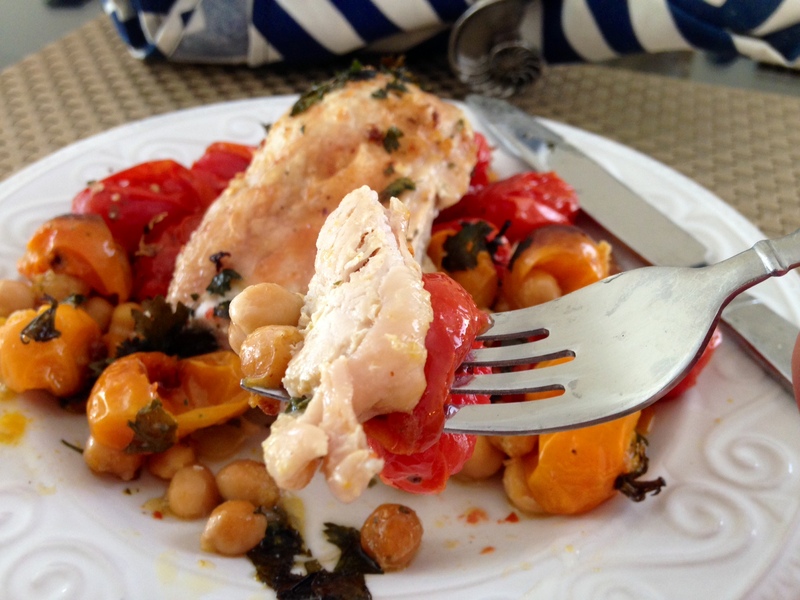 Chickpeas are another one of those superfoods. One cup of chickpeas provides you with 12g fiber and 15g protein. But this beans is not just about fiber and protein, which is amazing for appetite control but theses beans are rich in vitamins. minerals and phytochemicals or saponins, which are extremely helpful in the prevention of breast cancer and osteoporosis. At your next meal try swapping our your transnational carb loaded side for a protein and fiber packed bean! Step 1: Heat oven to 450 degrees. 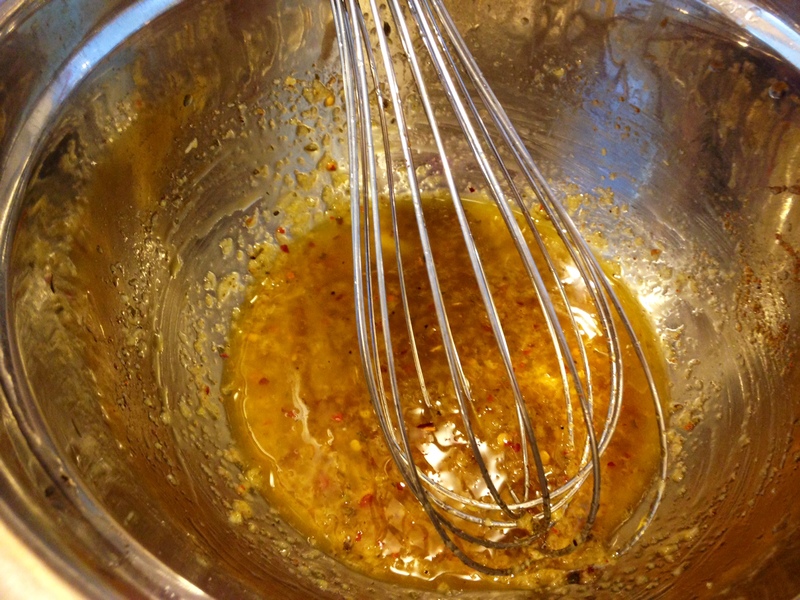 Whisk olive oil (5Tbps), garlic, pepperflakes, cayne pepper, cumin and paprikia together. 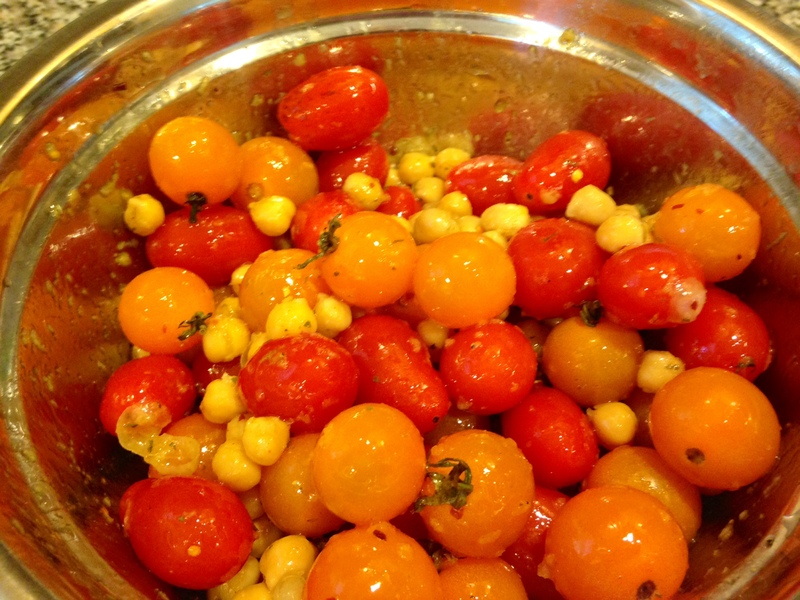 Step 2: Place Chickpeas and grape tomatoes in a large bowl. Pour olive oil mixture over and coat completely. 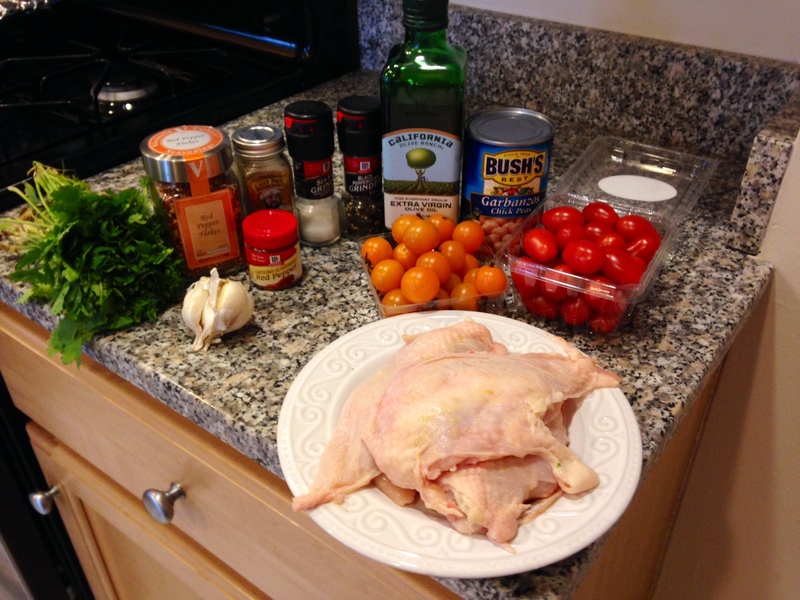 Step 3: Place chicken breast on a roasting pan, rub 1 tbps olive oil all over the chicken breast. 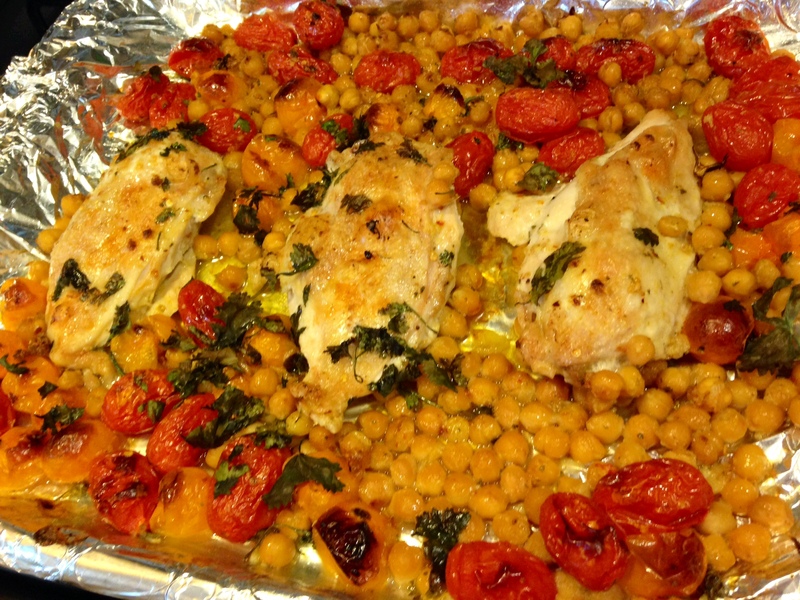 Then add the chickpeas and grape tomatoes to the pan. Step 4: Sprinkle pan with cilantro. 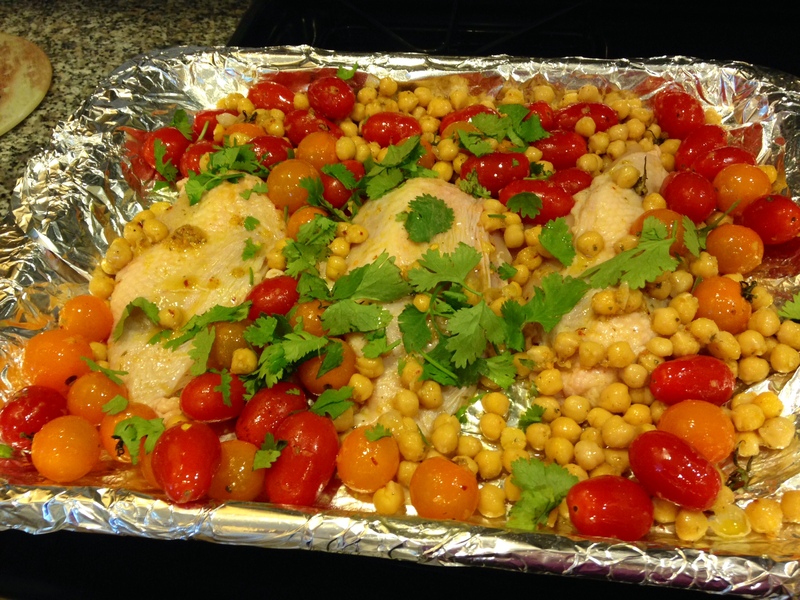 Plan pan in over set at 450 degrees and cook for 20-30 minutes, until chicken is cooked through. Enjoy! This entry was posted in Dinner, Lunch, Quick & Healthy, Weight Loss and tagged beans, food choices, High Fiber, Homemade, Lunch, Protein, Quick, superfoods, vegetables, Weight loss, wellness group. Bookmark the permalink.